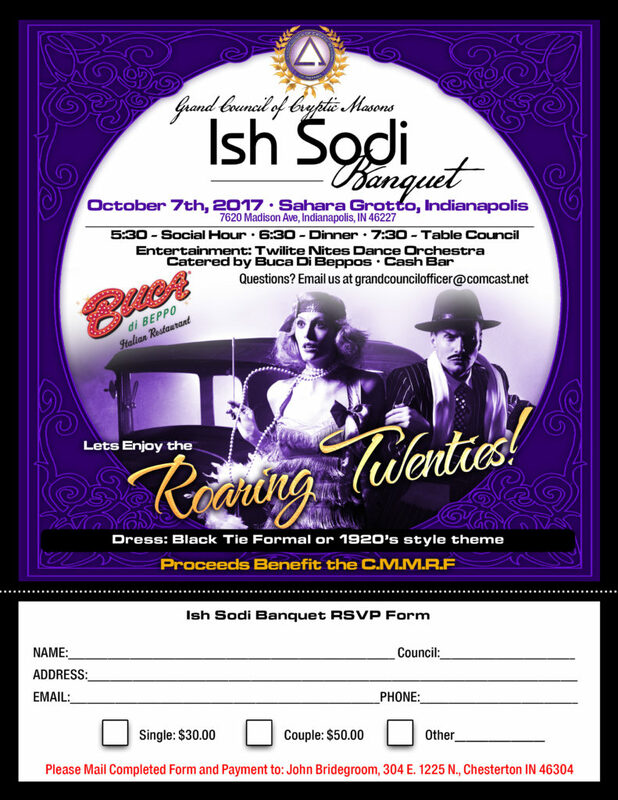 I would like to cordially invite all of the Companions and their ladies to join us for the Annual Ish Sodi Banquet, held at Sahara Grotto in Indianapolis on October 7th. The Ish Sodi Banquet raises funds for the Cryptic Masons Medical Research Foundation. This Year, we chose a Roaring Twenties theme, and will have the wonderful 10 piece Twilite Nights Dance Orchestra playing 20s era swing music. The meal will be catered by Bucca di Beppo’s Italian Restaurant! The evening will also include a Table Council with traditional toasts, a silent auction, and a speaker from the C.M.M.R.F. The dress for the evening will be Formal Black Tie, or 1920’s themed costume. A cash bar will be available and plenty of fellowship and good fun. I look forward to sharing a wonderful evening of music, good food and fun with you all, and hope that you will bring as many friends as you can find to come with! Posted in Website and tagged Banquet, CMMRF, Grand Council, Ish Sodi. © 2008-2019 Grand Council of Cryptic Masons of Indiana - All Rights Reserved.